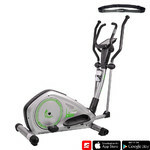 Electronically controlled elliptical trainer, adjustable pedals, HRC program, heart rate sensors, colour LCD display, quiet running. 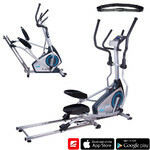 Elliptical Trainer inSPORTline Cruzz is a modern elliptical trainer with a wiide range of useful features and advanced functions. 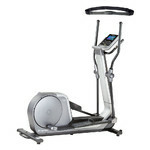 The sophisticated control panel with LCD display is user-friendly and easy to understand, allowing you to easily adjust data and program settings. 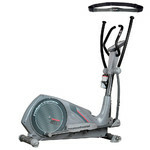 All necessary information are displayed, including time, speed, distance, heart rate and others. 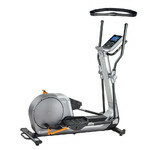 Elliptical Trainer inSPORTline Cruzz offers 12 pre-set programs, a HRC mode that automatically adapts resistance to your current heart rate to maintain an optimal frequency and user programs to set according to your needs. 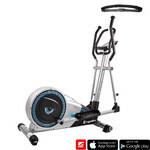 Thanks to a stable frame with 120 kg weight limit, many programs to choose from, high precision and modern design, Elliptical Trainer inSPORTline Cruzz is an excellent choice for regular home use.